Issue alert! I feel as if my wardrobe is missing out on a key summer staple, the denim vest. Two trend setters that rock jean vests with casual confidence are Hedvig of The Northern Light and model Kate King. Take Hedvig's cue and top off a summer dress with a denim vest or add one to skinny jeans and heels to create urban appeal. For more laid back ladylike looks I love the way King combined her distressed vest with a billowy floor grazing skirt one day and an accordion pleated skirt on another. One of the best things about the denim vest trend is that you don't have to break the bank; check out a few of my favorite finds below. I need a jeans vest and jacket so bad, these looks are amazing. Denim vests I love on other people but for me and my body for some reason they just don't look great on me! heck yeah! Love a good denim vest and the character it adds to an outfit! Denim vests are great. I have one in mint colour. I've been wanting one for awhile and you just convinced me! I'm really excited to see jean vests back in. They are so fun and funky. Love your choices! We posted about the same thing today! Ha! So obviously I am on board with you! Youuuuuuuu stop it! lol I just tweeted how I want to find a denim vest! Thanks for the suggestions! PS the gap vest is a girls vest *sigh* i almost got excited about it and the price. WAH! Not sure I'd be able to do summer without my denim vest! Such an important layering piece!! 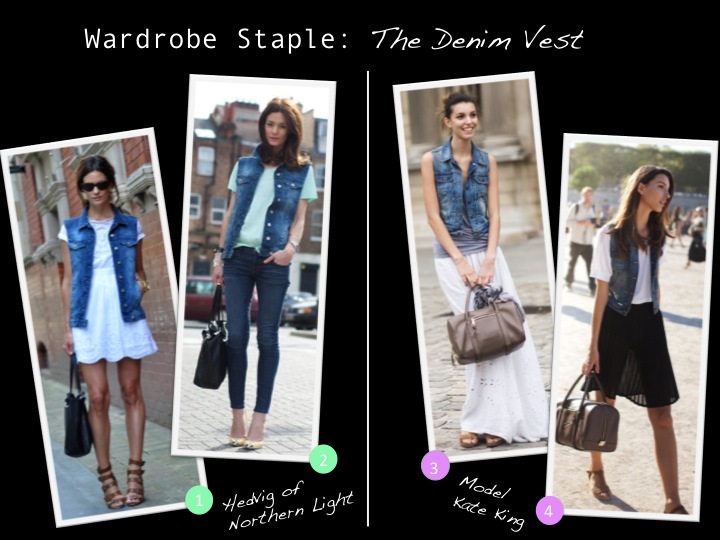 I love denim!These vests are just amazing, i would totally wear it!Love the outfits! i've always been afraid a denim vest wouldn't look right on me. they look so cool on everyone else though! So glad these are finally back! I've owned one forever and wore it constantly a few years back. Definitely pulling it out after seeing those pictures...great inspiration! this is some nice inspirations! So cute. Would love a denim vest with a bright orange skirt or something. Love denim vests!! They go with practically everything! Have a great week, beautiful! 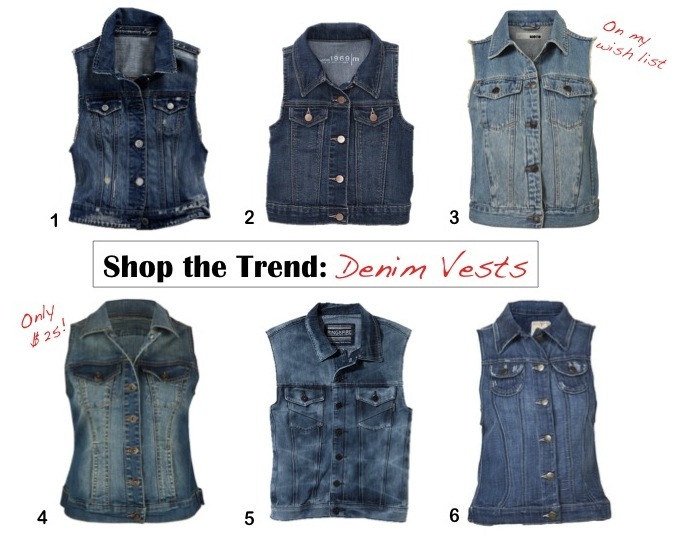 I'd love a denim vest, so versatile and fun. I'd definitely go for the Topshop one! i don't own a denim vest but i definitely want to now! Love that second look! I may have to dig out my denim vest and re-create this ensemble. Thanks for the inspiration:)! I have a red denim vest I thrifted last summer and I absolutely love it. I lived in it last year and surprisingly got so many compliments on it. I'm a huge advocate of denim vests. love that denim gilets, and it's easy to make by yourself! you got a great blog girl, we follow you now! maybe you like to follow us back? let me know! I wasn't a big fan of denim vest, but now I think if you know how to wear it it's very cute. been looking for one! great options! Love the color and wear on the American Eagle vest - super cute! I want to pull this off so bad!! Yeah love this hype! I recently did an DIY with an old demin vest, cut off the sleeves, tie dyed it and put on several studds. So easy but so great! i like a specific type of denim...not all denim looks good. I find that some look cheap. My preference is the american eagle one, by far the cutest!